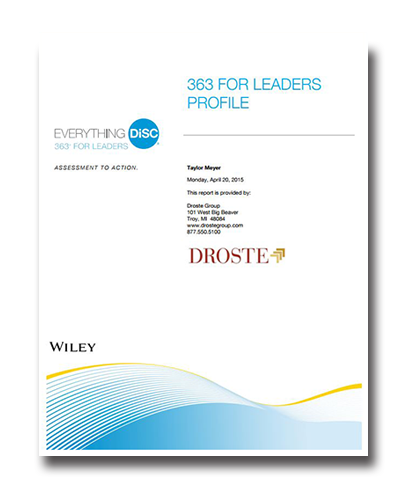 Everything DiSC 363® for Leaders combines the best of 360-degree feedback with the simplicity and power of DiSC®, plus three strategies to put into action immediately. It uses clear visuals and a conversational narrative style to interpret and explain the data, making the report easy to understand and use. Whether an emerging high potential or an experienced executive, participants incorporate critical feedback from direct reports, peers, and bosses into a development plan that is both productive and satisfying, ultimately elevating leadership effectiveness. To reduce the time and energy it takes to implement your 363 program, we’ve created support materials to help you organize and speed up your workflow. While every organization has a different process for initiating and approving a 360-feedback program, our workflow materials assume that the formal proposal for using Everything DiSC 363 for Leaders within your organization has been approved, and you’re ready to take the steps necessary for a successful implementation.